Pure, exalted and gracious influence enters the matter. Hence, change, alternation, increase and decrease, fluctuation. There is, however, a liability to be led away by enthusiasm; one may become "moon-struck" unless careful balance is maintained. By reference to the chart, it will be found that this Path joins the first to the sixth Sephiroth, crossing the Abyss which, in Qabalistic symbology, is conceived to be a barren desert of sand wherein die the thoughts and empirical egos of men, "birth-strangled babes", as the expression goes. Now GimeI is the letter given to this Path, and when pronounced, means a CameI. The Camel is the conventional "ship of the desert". The title of this Path is "The Uniting Intelligence", and its Yetsiratic attribution is the moon. 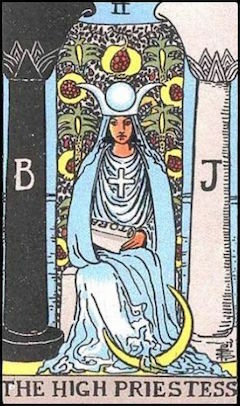 Its Tarot card is ll - The High Priestess of the Silver Star, picturing a throned woman, crowned with a tiara, the Sun above her head, a stole on her breast, and the sign of the Moon at her feet. She is seated between two pillars, one white (male) and the other black (female), comparable to the right and left-hand pillars of the Tree of Life, and the Masonic Yachin and Boaz. In her hand is the scroll of the Law. She is, in one sense, the Shechinah, and our Lady Babalon according to another system. In the old Rosicrucian grade system, the Supernal Triad constitutes the Inner College of Masters, and is called the Order of the Silver Star. Since the Path of Gimel or the Moon links the Supernal Triad with Tiphareth, serving as the means of entry to the Inner College, it will be observed that the Tarot symbols are consistent. Yet some students have allocated this card to Bes. Artemis, Hecate, Chomse, and Chandra are the deities attributed, all of them being lunar goddesses. Its colour is Silver, the glistening colour of the Moon; Camphorand Aloes are its perfumes; the Moonstone and Pearl being its jewels. The Dog is sacred to Gimel, probably because the huntress Artemis always had hounds in attendance. The Bow and Arrow, for the same reason, is its symbolic magical instrument. The Priestess of the Silver Star.